Granit Xhaka (l) and Xherdan Shaqiri (r) celebrate their goals against Serbia on June 22nd. On Friday, June 22nd, the Swiss team defeated Serbia by a score of 2 to 1. Switzerland’s two goals were scored by Granit Xhaka and Xherdan Shaqiri, two Swiss players of Kosovar origin. To celebrate their two (beautiful) goals, the players made a gesture evoking the two-headed eagle that graces the Albanian flag. This celebratory gesture was enough to set off an avalanche of angry reactions and threats of sanctions against the two players for ‘politicizing’ their celebration. The match itself was noteworthy in that the victorious Swiss ‘national’ team includes seven players of Yugoslav origins, primarily Kosovar Albanians, but also Croats and Bosnians. The Swiss coach himself was born in Sarajevo. It’s a very Balkan team. This can be explained by the fact that many refugees of the Yugoslav wars during the 1990s settled in Switzerland. It was immediately clear that this match was going to have a symbolic and political significance that far outstripped its purely athletic context. There was a clear risk that the match would become a kind of ‘Balkan derby.’ Not that it was anything like the contest between Serbia and Albania in 2015, which had to be interrupted when a drone flew above the stadium with a flag of “Greater Albania,” triggering brawls afterwards. Yet in the end, last Friday’s incidents during the World Cup had even greater international resonance. It was after all because the two goals scored by two players of Kosovar origins that Serbia fell to the Swiss team. What an irony, considering the racism that migrants from the Balkans and other countries of central and eastern Europe face in Switzerland, and has become ever more vehement in recent years. On Friday evening, these two ‘kids from Kosovo’ became ‘national heroes’ while playing against Serbia. Yet that’s how it is. It was two Kosovars who scored the winning goals, but unfortunately it was the Swiss team that won. One could say very much the same thing about the French team, whose biggest stars are from the Maghreb and sub-Saharan Africa, representing populations very much targeted by discrimination in continental France. For its part, Kosovo itself was not even allowed to join FIFA until 2016 and has only played a few official matches. 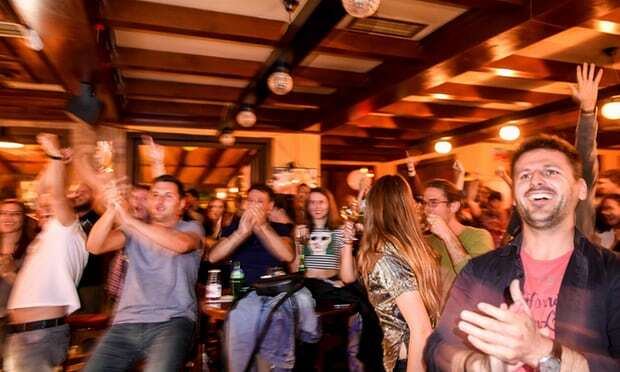 Kosovans celebrate Xhaka’s goal as they watch the match in a pub in Pristina. Photograph: Armend Nimani/AFP/Getty Images. So these two young men – one, the child of refugees and the other a former refugee himself, who came to Switzerland with his parents as an infant – score winning goals against Serbia. 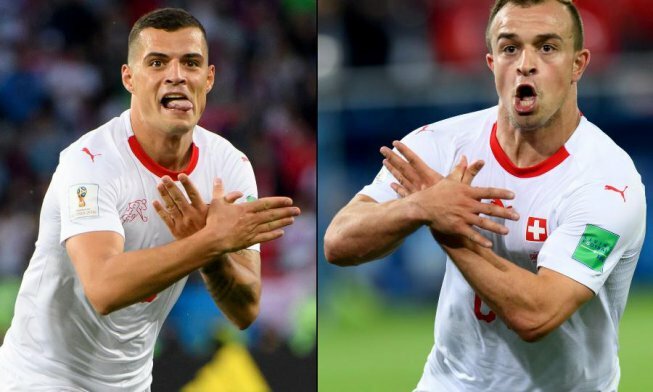 They celebrate their goals by mimicking the double-headed eagle on the Albanian flag with their hands. It’s their way of reminding the whole world of their origins, of the fact that they are Kosovars, and that a goal scored against Serbia of all countries is not just any goal. Evidently, this has become a scandal. There’s even talk of sanctions against them. But such sanctions would be the real scandal; it would be a concession to Serbian nationalism so that football players don’t get into the habit of sending political messages from the field during the world’s biggest spectator sporting event, at a time of deep social and political crises. Whether or not one agrees with that way of celebrating a goal, the Swiss-Kosovar players did not make a Nazi salute, or defend crimes against humanity. The double-headed eagle is not even directly offensives to Serbia in particular, but above all a spirited salute in defense of Albania and Albanians. But this gesture bothers some because it evokes the Balkan wars of the 1990’s in which the Serbian state was one of the primary aggressors—but in which the imperialist states of the West also played a role (remember, the Dutch blue helmets standing on the sidelines during the Srebrenica genocide, among many other examples). The gesture bothers people because it recalls decades of oppression visited upon the Kosovar Albanians, whose independence is still not recognized by numerous states around the world: not only Russia and China, but also Spain, Greece, Brazil, Argentina, South Africa, India, Iran, etc. In effect, the ‘Kosovo question’ reminds us as well that many peoples around the world are oppressed and that many of the world’s states oppress entire populations and trample on their national rights. Some have been very quick to call on the crimes committed against the Serbian population of Kosovo (while strangely omitting those of Slobodan Milošević and his regime) to justify their ‘indignation’ with the Swiss-Kosovar players. These crimes were real. But that has nothing to do with Xhaka and Shaqiri’s celebratory gesture. Rightly understood, people of Kosovo, Albania, and Serbia have nothing to do with the crimes committed and ordered by ‘their’ leaders. In general it is those leaders’ accomplices who use the crimes committed against their respective ‘national’ civilian populations in order to reinforce reactionary nationalism and arouse the proletarian and other popular classes of one nation against another. In this sense, making a ‘scandal’ out of the Swiss-Kosovar players’ gesture does nothing but nourish this reactionary nationalism—on all sides. 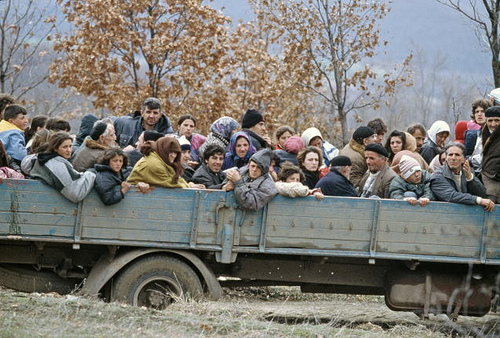 Kosovar refugees fleeing their homeland in the wake of Serbia’s ethnic cleansing campaign in 1999. This article by Philippe Alcoy originally appeared on Revolution Permanente, shortly after the Serbia-Switzerland match-up at the World Cup. It was translated from French by William Coker.